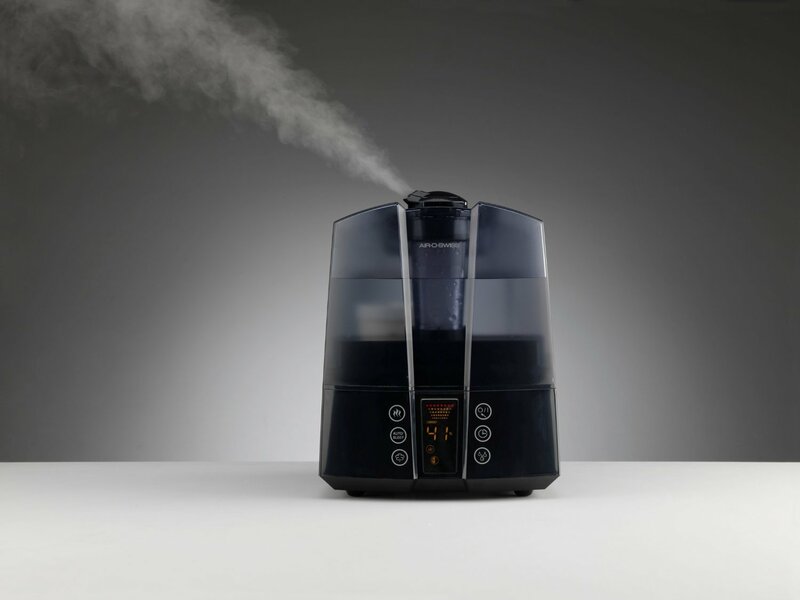 With so many exceptional humidifiers on the market, it is nearly impossible to figure out which one to pick when purchasing. From size and colour, to quality and maintenance, finding the right pick to suit your home or work space can be difficult, but we’ve come up with our top rated humidifiers to make your choice a lot less complicated. If you’re looking for a humidifier that will provide you with reliable relief from ongoing allergy and dry skin symptoms, then we recommend the Honeywell Germ Free Cool Mist Humidifier. This humidifier is an evaporative humidifier that has 2 gallons of water output a day. 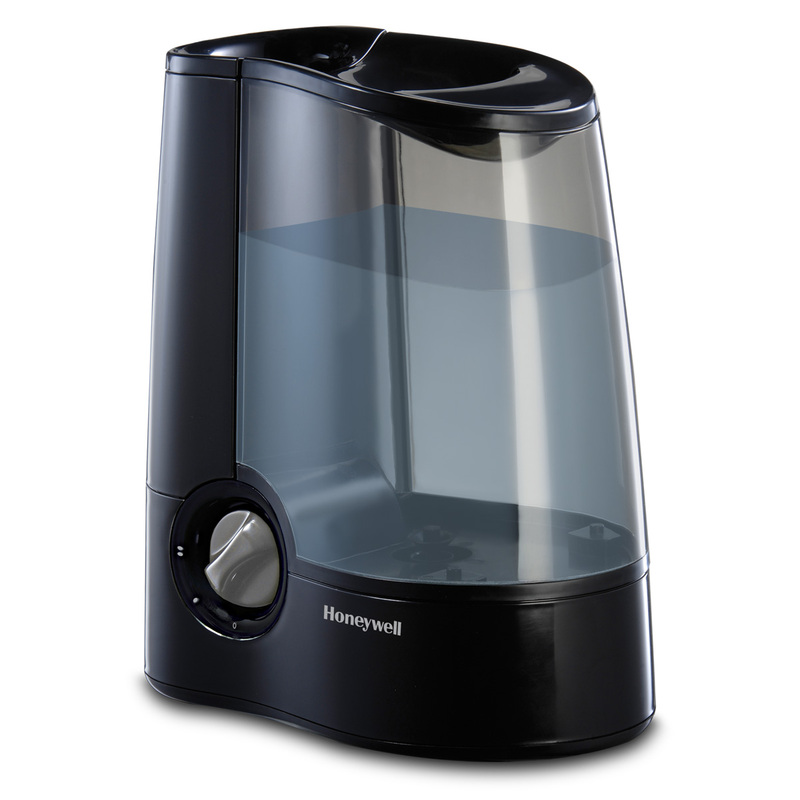 Humidifying up to 500 square feet room a 360 square feet space, the Honeywell Germ Free Cool Mist Humidifier is perfect for perfect for bedrooms and living areas. Because this appliance is a cool mist humidifier it is safe to use around children (unlike a warm mist humidifier that can cause burns on the skin). One of the main features of the Honeywell HCM-350 is the germ-free feature. It takes two processes to make sure that the moisture released by the humidifier is clean. It uses ultraviolet light to kill harmful viruses and bacteria that exists in the water and prevents the growth of germs with an antimicrobial process. Killing 99.9% of germs and bacteria in the tap water, you can be sure that air you are breathing in is germ-free. The humidifier is also easy to clean, as it is dishwasher safe and designed to sit flat in a sink. With three internal fan, the humidifier operates on three different speed levels – low, medium and high speed. Unfortunately there is no humidistat and programmable function as well, you need to shut it off yourself. But the Honeywell Germ Free Cool Mist Humidifier does have a self-regulating feature which means it adjusts automatically and produces as much amount of humidity as possible. Being both a warm and cool mist humidifier, the Air O Swiss 7147 Ultrasonic Humidifier is definitely one of our favorites. The appearance of humidifier in general and this type of machine in particular has a strong impact in your home as it helps you to breathe easier and decreases the risk of being sick. Perfectly designed and small enough to blend in well with any environment, this humidifier is just nonie pounds in weight and 4 x 11.6 x 11.6 inches in dimension. Even though it is smaller than other humidifiers, it does not lack in power. Perfect for a medium room like a master bedroom or living room, the humidifier has the ability to work well in a large space of 600 square feet. Because it is both a warm and cool mist humidifier, you could easily choose the suitable moisture program which matches your room. The Air-O-Swiss AOS 7147 Ultrasonic Humidifier is also extremely easy to use, has pre-set timer and has an effective sleep mode. To reach the highest effectiveness, choose an ideal place to store the machine. During the winter months, your skin get stripped from all the moisture it holds. This can lead to discomfort and irritation. If you suffer for this in the cold weather, then you should get an Aprilaire 500® Whole-House Humidifier. Adding moisture throughout home is what you need to add moisture to your skin so it remains happy and healthy throughout the year. 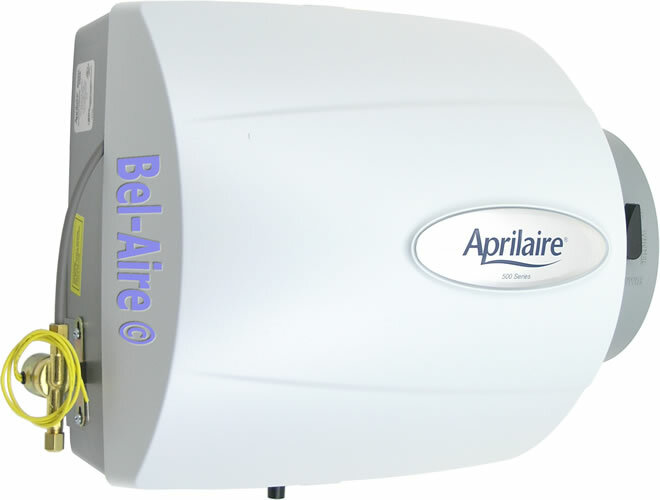 Compared to the Aprilaire 600® Whole-House Humidifier, the Aprilaire 500® Whole-House Humidifier is regarded to be more economical for smaller homes and spaces. Working well in small to medium sized rooms up to 3,000 square feet, this humidifier is compact measuring only 16 x 11 x 13 inches in dimensions. Compared to other whole-home humidifiers it is also extremely light at 7.4 pounds making it easy to carry from room to room. This humidifier is also equips numerous supportive accessories, including automatic digital control, outdoor sensor, water pad, 110V to 24V transformer, and built-in bypass damper. Each of this accessories play an important part in making your experience of using this humidifier more effective and pleasant. The built-in bypass damper is an important part of the machine as it helps simplify its installation. The humidity level inside your house can be seen on the automatic digital control, while the outdoor sensor indicates the outdoor humidity. Knowing this makes allows you to know the exact humidity both inside and outside your home, and adjust it accordingly. The humidifier also has a 30-gallons per hour of water feed rate. 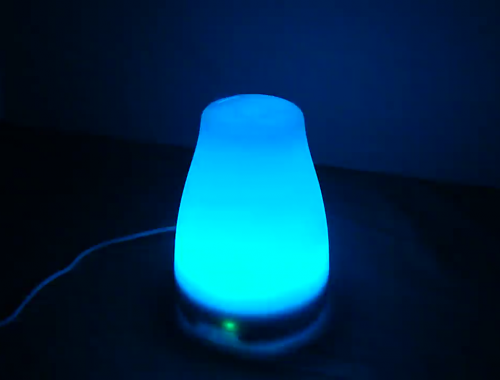 If you’re worried about noise and sleeping with the humidifier on, then a major plus about this appliance is that it is almost completely silent. 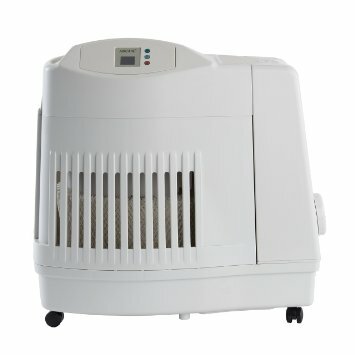 This humidifier is also extremely easy to clean and the brand Aprilaire is known for having products the have longevity. With numerous features and excellent online review praising this brand and product, the Essick Air EP9 500 Pedestal-Style Humidifier is definitely one of our favorites. 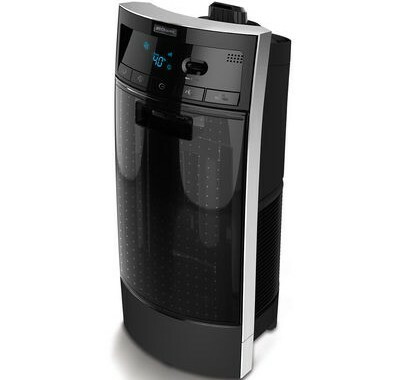 Ideal for both the warm and cool weather, this humidifier is a great addition to your home or office space. Adding to its appeal is this appliances beautiful design and portability. Only weighing 25 pounds and with four caster wheels, this humidifier can easily be moved from room to room. One of the main features of this humidifier is that it is energy saving which saves users from a high electricity bill. It takes advantage of 135 electricity watts for each time of continuous use. This humidifier is best used in larger areas of up to 2,000 square feet making it perfect for office spaces and living and dining rooms. 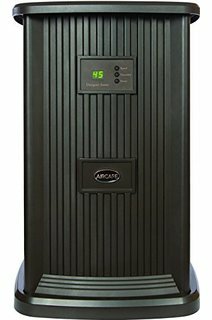 The Essick Air® AIRCARE® EP9 500 Whole-House Pedestal-Style Evaporative Humidifier is also can easy to clean, and the five gallon water tank is easy to remove to do so. The humidifier also has a digital display making it easy for you to monitor the humidity inside your home. With incredible features, this humidifier will not only keep you and your family healthy and happy. but also save you some money on both doctors and electricity bills. It is a definite must-buy for those who want a humidifier for large spaces.